Frank Lloyd Wright, born in Richland Center, Wisconsin, established an architectural apprenticeship program in Spring Green, Wisconsin. In 1937, he started bringing the program for the winter months to northeast Scottsdale, Arizona in the foothills of the McDowell Mountains. Our “Insights Tour” leader told us that Wright required apprentices to bring three items to Taliesin West: a tux (or gown), sleeping bag, and musical instrument. This was, and is today, a “hands-on” educational program. The sand, gravel, and stone used for construction material organically integrates living space with the desert. Wright’s business office and the living room, called the “Garden Room,” are entered through a small room with a low ceiling. In both expansive rooms we sat in Wright-designed furniture and delighted in the natural light with canvas roof and open windows bringing in the blue sky. The Kiva, a closed square space (whereas most of the other spaces incorporate triangles or hexagons), serves as a classroom and movie viewing space during the winter and as storage space during the summer. The partially underground Cabaret Theater features near perfect acoustics. Dramatic terraces, gardens, and walkways overlook the rugged Sonoran Desert. 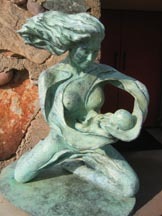 Art abounds throughout the grounds with one area featuring a garden of sculpture by Heloise Crista. Her work captures one’s inner freedom and the evolution of being. 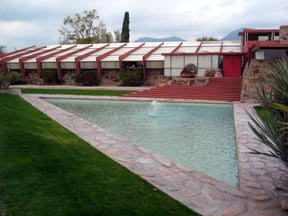 Touring Taliesin West provides an opportunity to experience the genius of Frank Lloyd Wright. 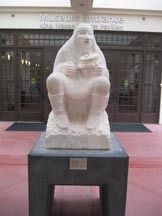 The Heard Museum, primarily Native American artifacts and art, located in downtown Phoenix was founded in 1929 by Dwight and Maie Heard. The “We Are!” gallery recognizes Arizona’s 21 federally recognized tribes. Each tribe was given the same size pod to tell their own story. Some of the tribes gained recognition only in the last thirty years. “Remembering Our Indian School Days: The Boarding School Experience” chronicles the controversial practice of removing Native children from their homes and placing them in boarding schools. The first of these boarding schools was located in Carlisle, Pennsylvania and closely followed by one in Chemawa just north of Salem, Oregon. The signature exhibition, “Home: Native People in the Southwest” has a large collection of Hopi Katsina dolls, including the Goldwater collection. According to the display, “Katsinas are the spirit messengers of the universe, representing all things in the natural world as well as Hopi ancestors.” The gift shop and bookstore has an impressive array of high quality art items. The Heard Museum is a wonderful place to learn about the native peoples of Arizona.